When informed that this writer had originated the report of the Secret Service investigation based on comments to this writer by an agency spokesman on Saturday, the agent repeated the statement, “the Secret Service does not discuss matters of protective intelligence”, but did not deny any investigation of Madonna was taking place. The agent said no Public Affairs spokesman was available to discuss the matter further. In contrast, on Saturday afternoon a phone call by The Gateway Pundit to the same number received a different response. The agent who answered the phone said the agency was “aware” of Madonna’s statement and then transferred the call to an agent who also said the agency was “aware” of Madonna’s statement and then discussed the matter, saying an investigation would be opened but that the decision on whether to prosecute would rest with the U.S. Attorney’s office. Transcript from the video excerpt of Madonna’s speech made at the Women’s March on Washington which appeared to be from prepared remarks. “Yesterday’s Rally. was an amazing and beautiful experience. I came and performed Express Yourself and thats exactly what i did. However I want to clarify some very important things. I am not a violent person, I do not promote violence and it’s important people hear and understand my speech in it’s entirety rather than one phrase taken wildly out of context. My speech began with; I want to start a revolution of love. ♥️ I then go on to take this opportunity to encourage women and all marginalized people to not fall into despair but rather to come together and use it as a starting point for unity and to create positive change in the world. Note: PJ Media published an article on Monday by Tyler O’Neil accusing The Gateway Pundit of publishing a “false report.” An apology and retraction is hereby requested. 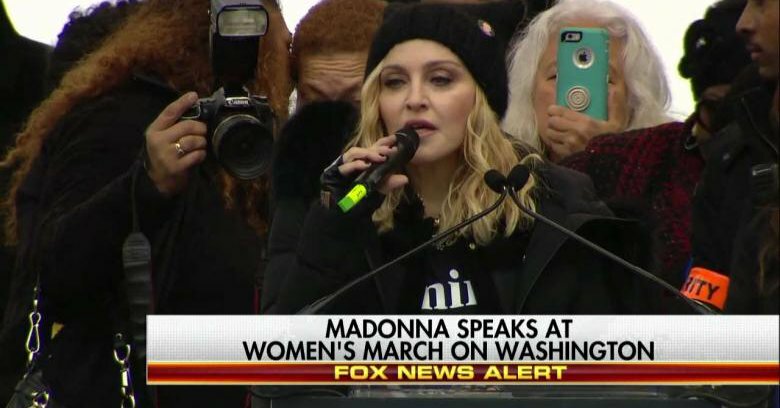 “F**k Donald Trump and F**k the Secret Service,” Madonna posted in the wee hours of the morning, ironically taking after the president she so boldly condemned. Perhaps realizing the folly of this statement, the actress promptly deleted the tweet, but it was memorialized by others. …Saturday afternoon, Gateway Pundit reported that “a spokesman for the Secret Service” said “the agency is aware of the comment.” The spokesman added that “an investigation would be opened but that the decision to prosecute rests with the U.S. Attorney’s office. Unlike the Daily Mail which reached out to TGP, PJ Media made no effort to contact TGP regarding the report of the Secret Service investigation. While it is true no official statement on Madonna has been issued by the Secret Service, it is also true a spokesman told TGP an investigation would be opened. Apparently TGP was the only outlet to get a comment from the Secret Service. The New York Post reported Sunday an unnamed US official said Madonna’s comment would be looked at by the government. Also, TGP investigated the alleged deleted tweet by Madonna and could not verify that it was not a photoshop so decided to not report on it. PJ Media cites no evidence beyond screen grabs as proof that Madonna actually posted the alleged deleted tweet.